I've always wondered what people think is the worst thing to see on a house viewing. Obviously I've got some ideas of my own but it would be great to state some facts and give some real tips for property viewings, based on statistics. Well A Passion For Homes literally read my mind! 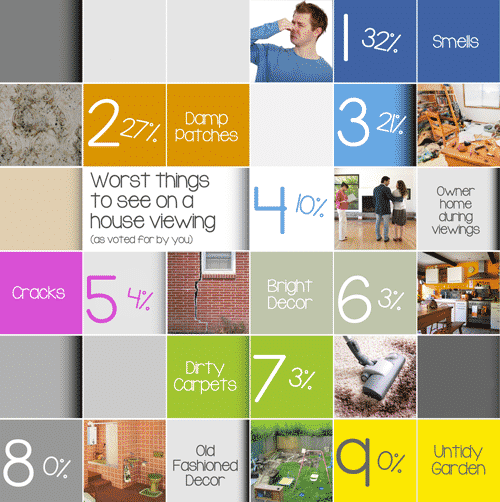 They run really interesting monthly votes/polls, this particular one was "The Worst Thing To See On A House Viewing". So we did a little graphic to illustrate the results. Oh, also you should definitely follow them on Twitter @passionforhomes. Last updated on 27/08/2013 by Jonathan Rolande.